IT security consultant Kevin Beaver calls in to discuss why intrusion testing is a critical part of any IT security assessment – particularly for Windows environments. While for some, the term hacking might arouse thoughts of convoluted plots in big-budget spy movies, the type of hacking that is most useful to server administrators is far different. When it comes to IT security assessments, ethical hacking can be an extremely useful technique. But what does ethical hacking even mean, and better yet, how do you get started? Sometimes referred to as penetration testing and red teaming, the ethical hacking process might involve more than you think. We spoke with Kevin Beaver, IT security consultant and author of the recently released Hacking for Dummies 3rd Edition from Wiley Publishing, to get some insight into the world of ethical hacking for Windows environments, and how he's seen first-hand just how valuable such practices can be. 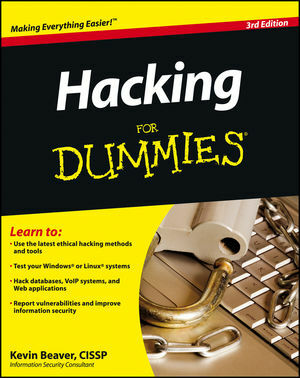 Hacking for Dummies, 3rd Edition is now available for purchase from Wiley Publsihing. Want to win a free copy? Send us your best Windows server security tip by May 1, 2010. The winner for the best tip will receive a free, autographed copy and see their work published on SearchWindowsServer.com.